The theme for this issue is something along the lines of full-spectrum maternity, with articles on how humans have and still do kill infants, destructive goddesses, the relationship of language to person-hood, cannibalism as a cross species practice, and so much more. Our cover image for this issue, a photo of one of the two destroyed Elwha dams, speaks to some of the terrain we're exploring. At face value, the destruction of the Elwha dams is an incredible and rare success story. Decades of struggle through legal and less- or not-legal means were finally successful. Dams are one of the most signficant interventions in indigenous subsistence practices, and the removal of these two has meant remarkable resuscitation in the ecosystem of the river, with birds, salmon, native plants, all coming back with almost unbelievable speed. And yet, there are more complicated ramifications. First, it signifies a struggle that was successfully pushed through the apparatus of the state. For those of us who recognize the structural and perspectival limitations of fighting by the rules of the current system, this step towards a balanced ecosystem will be two steps back if it's seen as a reason to use the tools of the system. More significantly, one reason to build dams is for energy production. Given the scale of the (ever-increasing) demand for energy, there are no good options--to the extent that sincere and passionate environmentalists have promoted nuclear energy, despite the toxins lasting for thousands of years, because everything else is worse. We celebrate the victory of the Elwha River, while keeping clear in our mind that that victory, that ecosystem's return, can only come at the cost of other ecosystems. That is the way of the civilization that surrounds and informs us. That victory is both real and not real, in a world in which floating continents of plastic and miles of fishing nets denude the oceans, in which ongoing oil-spills in Africa have no one even attempting to clean them up, in which toxic waste is buried or dumped offshore by the multi-ton load, etc. The very real successes happen in a context of overwhelming poison, misery, and extinction, and cannot be said to offset them. 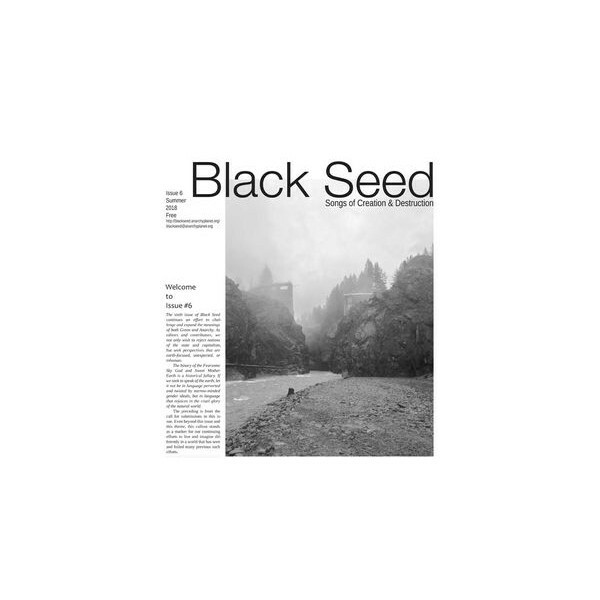 The goal of Black Seed is to look at all of it, not to hide from the bad or over-emphasize the good, to see humans, to see ourselves, as small, overly-loud parts of a whole that was doing better when we were quieter, and to consider how we can loudly remember or learn to be quieter again, in a civilization that promotes the equation of silence with death. 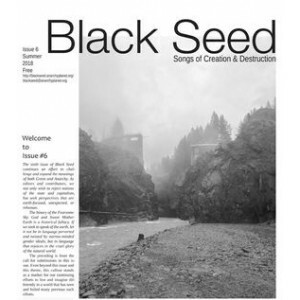 Black Seed is a 32 page newspaper format biannual publication. Black Seed continues where Green Anarchy left off. The US based green anarchist paper from the Little Black Cart camp.